You wouldn’t expect to find some of NYC’s best dumplings on St. Mark’s Place. It’s a circus at the best of times, the Macdougal St of the East Village. But next to Papaya King, a tattoo parlor and yet another really bad Japanese joint, The Bao is serving the best xiao long bao I’ve had in the city. Sorry Chinatown and Flushing. The pork and crab soup dumplings (six to an order) have those delicate thin skins all soup dumplings should aspire to, and a perfectly balanced surf-and-turf filling. 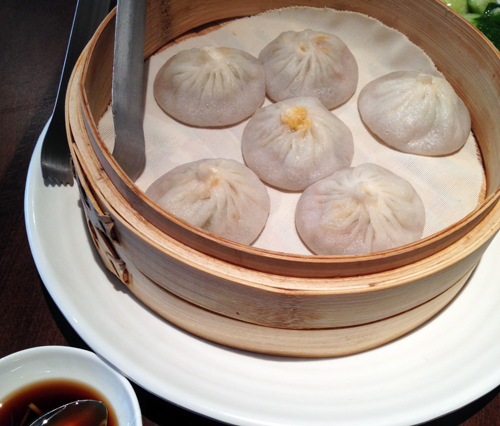 They’re as close to Din Tai Fung‘s perfect xiao long bao as New York is going to get. Don’t be put off from ordering the “super spicy” soup dumplings, they have a nice Sichuan kick and great meaty pork flavor, but are just pleasantly spicy, not mouth-numbing so. Don’t forget to drizzle some black Chinkiang vinegar with ginger over each dumpling. The scallion pancakes are deliciously crispy and not very greasy, unlike Chinatown’s dollar pancakes. There’s a refreshing cold cucumber with garlic dish, and a slightly confusing iced tomato appetizer, large tomato sections in chilled sugar syrup, something I’d enjoy as a dessert. The window and soup dumplings say Shanghai but the dan dan noodles are a great addition to the menu: chewy and slippery with chilli oil. The smaller portion size means you can order plenty of dishes, or just stick to the dim sum staples. At least one of you should order the Champagne milk tea for comedic value – simply iced tea in a mini Champagne bottle on ice. It’s cute. The Bao, 13 St. Mark’s Place, between 2nd and 3rd Aves.